Wellness Consulting was founded with passion for fitness and health, but even more passion about putting only natural products into our bodies. After being the queen skeptic of CBD oil, owner and creator Kelsey gave it a shot, and was hooked from day 1. She had never experienced such a natural form of both cardiovascular endurance and increased strength in her life. After trying countless amounts of “workout remedies”, she had finally found the solution that would not only work as a pre workout supplement, but also greatly impact post workout recovery. The reduction of stress and anxiety was just an added bonus. Her fiance had a background in the cannabis industry, and although there is zero THC in our product, the connections to the most pure product on the market were unsurpassed. After long hours of perfecting the product and making sure it could be affordable to the masses, SWEAT CBD was created. Now we can offer you a product that we are so proud of and can be backed by lab testing and customer testimony. Our product is grown and manufactured in California, and we work hands on to bring you the cleanest CBD on the market. From farm to factory, our product is brought to life by those we know and trust. We are so excited to share this product with you and hear all the ways CBD will change your life as well. All SWEAT CBD products are 3rd party lab tested to show purity and potency. Click link below for lab results. 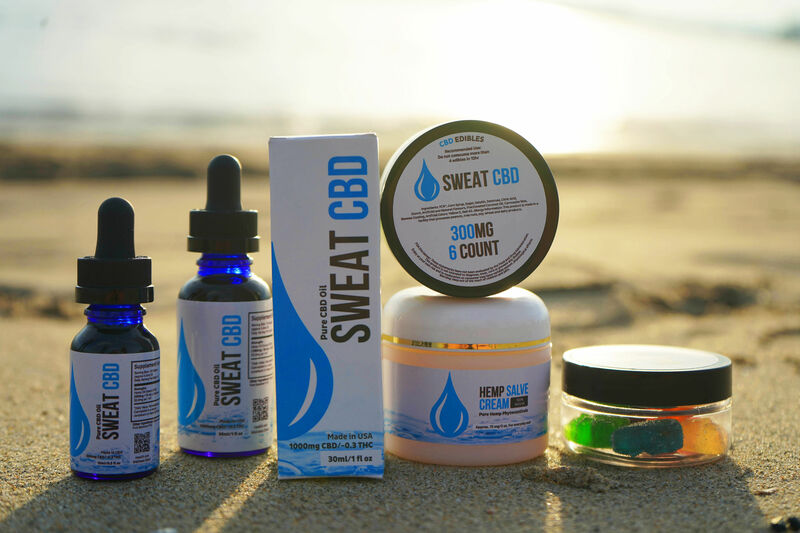 SWEAT CBD OIL JUST RELEASED!